Yet the Church’s understanding of this great Apostle’s ministry is entirely different. Yes indeed, the Holy Apostles, for fear of the Jews, had shut themselves up in their chamber; yes indeed, many of them were assailed by doubts, even though their Divine Teacher, Jesus Christ, had promised His Resurrection to them. Christ promised His Resurrection to them. If they had not had the doubts, they would not have rejected or abandoned Christ, which they did during His agony on the Cross. But now, when they were all together, they once again prayed that their Divine Teacher might grant them at least some sign of His Resurrection. And the Savior appeared to them in a manner they had not anticipated. 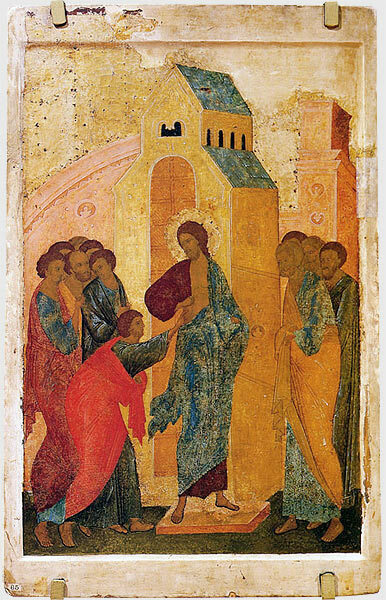 He appeared in His transfigured, resurrected body, in the same body in which the marks from the nails, gaping like wounds, were still present; yet it was also the same body that had already been transfigured, not impeding the Savior from passing through the wall of the chamber to appear to the Apostles. It was frightful to imagine that an apparition might have appeared to them, tempting them. But the Savior, seeing their lack of faith, here too condescended to them by sharing a meal with them. And when they saw that this was not a spirit, but in fact their Divine Teacher come in the flesh – that is, that He had fulfilled His promise to the very end – they rejoiced. But the Holy Apostle Thomas was not with them. When he heard about this, he spoke words that, again, were not some grand apostolic words, but were simple human words: that he would not believe in the Savior’s Resurrection until he had placed his fingers into the wounds of His body. It seems that in a simple, human way he had again begun to doubt – but the other Apostles had doubted, too. In the words of the Apostle Thomas there was something else along with doubt: he did not simply want to see or hear the Risen Christ, he insisted on boldly putting his fingers in the nail wounds. I recall that the many philosophers who developed a theory of knowledge in subsequent centuries emphasized that man’s most trustworthy and compelling means of perceiving reality is the tactile: to touch something with one’s own hands. In fact, we all live in an age when people believe primarily in that which we can touch with our own hands. Indeed, the Apostle Thomas required the clearest evidence that Christ had risen: that He had risen in the body, in the very body in which He had been nailed to the Cross. We reflect on this during the festal days following Pascha, when we do not especially feel like reflecting on anything difficult; during days when the joy of the Paschal celebration sometimes generates in us the illusion of our profound attachment to Christ; during days when we have no doubts in the Risen Savior because we are not generally inclined to exert ourselves reflecting on Him. Therefore, a reminder of the doubting Apostle Thomas can even introduce a certain discord into our souls. Bearing in mind the words of the nineteenth-century Epistle of the Eastern Patriarchs concerning how they could not change anything in the Church because the guardians of the faith are the people of God (words that sounded ambiguous coming from the mouths of the Church’s hierarchs), we call to mind the authentically popular designation of the Apostle Thomas as the unfaithful Thomas. In so doing we essentially shrug off the need for serious reflection on this passage from the Gospel. It is as if each one of us thought of ourselves as a faithful Thomas. Meanwhile, a thoughtful appreciation of the Gospel account reveals to us a man of the utmost sincerity and purity. It is no accident that he was one of the Apostles; it is no accident that he confirmed the Church of Christ in this world by his subsequent apostolic ministry and martyric death for Christ. This same Holy Apostle Thomas at some point doubted what his fellow Apostles had told him. Why, strictly speaking, should he have believed them unconditionally? Should he have believed the same Apostle Peter who had declared that even if everyone else denied Christ, he would not; but then denied Christ three times, being the first to deny Him? Why should he have believed the other nine Apostles, who had also abandoned Christ? 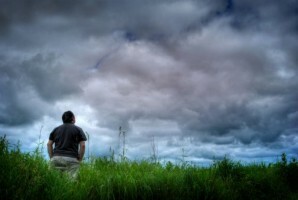 Why should he have believed himself, for he too had abandoned Christ? It is quite possible that doubt arose in the soul of the Apostle Thomas: perhaps his fellow Apostles, gathered for fear of the Jews, had seen an apparition, and it only seemed to them as if Christ had risen and visited them? We most often perceive the doubting of the Holy Apostle Thomas as a sign of weakness and lack of faith. Moreover, at the end of the Gospel reading it is stated that blessed are those who have not seen, yet have believed. And we, of course, include ourselves in the category of those blessed ones who, not having seen, yet believe. In that case, for us the Apostle Thomas stands out as a striking example of the lack of faith against the background of our own faith, the faith of those who have not seen and, perhaps, even do not now see Christ, because we too simply both affirm that we are Christians and refer to ourselves as Christians. As such, the Apostle Thomas reminds us of the obvious truth that Christians are obligated to doubt: to doubt themselves, to doubt their experience of God, and to doubt their faith in God. There is absolutely no sin in this. After all, faith is not the same thing as credulity. When calling to mind the popular description of the Apostle Thomas as the faithless Thomas, we should also call to mind our own history, when our own nation, which bestowed the designation of “faithless” on the Holy Apostle Thomas, expressed its own faithlessness in the most frightful manner in times not long past. The credulity with which our nation followed those who called on it to destroy its own Church and its own country is evidence that it did not then have the ability to doubt those who offered it the easy right to impiety. Thus, recent history shows us how important the experience of the Holy Apostle Thomas is. Moreover, if we read the Gospel more attentively, we will find the following: the Apostle Thomas did not require anything special for himself. 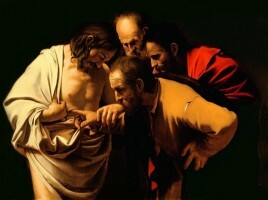 After all, Jesus Christ Himself had repeatedly shown Himself to His disciples, proving to them that He had risen by showing them His nail wounds. The Apostle Thomas differed from his fellow Apostles only in the sense that he, not having seen this evidence, wished for it, expected it, and then received it from Christ. This is a very important theme in the spiritual life of a Christian. When we, either out of indifference or fear, neither doubt nor ask questions of God, then we are lying. God awaits questions from us. He does not need pious puppets. He awaits any one of our questions and is ready to answer them all. The more tempting and seductive, but essentially honest, our questions to God are, the more appreciable God’s answers will be. God is not afraid of our doubts. He is prepared to listen to our doubts and to dispel them all. The Holy Apostle Thomas reminds us, during these days when the Paschal joy has begun to wane, as do sometimes our thoughts and feelings, of the labor awaiting us throughout all the upcoming years of our lives. He calls on us to follow Christ, to live in Christ, and to reflect on Christ responsibly and consciously; and not to love and believe in Him mindlessly, as we so often do in this life in relation both to our loved ones and to the Lord God Himself. It is a pity that the Apostle Thomas has not occupied his rightful place in our tradition. 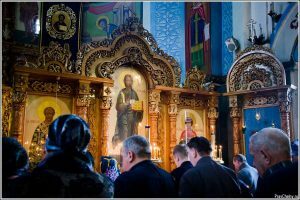 I have in mind our cultural and historical tradition, not the Church’s Tradition, which has elevated this Apostle to such a lofty place one week after Pascha by devoting such marked attention to this very sincere and pure man’s doubts. Honesty of belief is the key to its authenticity; authentic faith indeed performs miracles and can bestow on anyone, even the feeblest, all the remaining spiritual talents. But one needs to begin precisely with this same sincerity and honesty, the same sincerity and honesty with which the Apostle Thomas initiated what sometimes strikes us as an impious conversation with Christ. Indeed, many of us do not resolve to approach even a priest with the same questions and doubts with which Thomas approached Christ; many of us do not resolve to present our doubts to even our own brothers and sisters in Christ. What would they think of us? What if they suddenly decided that we have little or no faith? Falsehood thereby accumulates in our souls and relationships; falsehood that, concealed under the illusion of heartfelt, unthinking and, therefore, seemingly firm faith, essentially turns us into people who truly know neither ourselves nor our neighbors. And to live in illusion about ourselves and our neighbors is, after all, a great temptation and a great falsehood. Therefore, let us allow this unanticipated invasion of the Holy Apostle Thomas into our Paschal joy not only to put us on our guard in regards to ourselves, but also to calm us in regards to the fact that God awaits any one of our questions. And every one of our sincerely posed questions will receive an answer from Him, an answer that in the long run will introduce us into authentic Paschal joy, not only in the days following Pascha, but for all the days of our lives. Amen.